Use an Old Fashioned Cocktail glass and serve with a small bar spoon in glass. As time passed, bartenders have substituted nearly every type of whiskey into the Brainstorm. They’ve also substituted all vermouth types, adjusted proportions, and swapped glasses. 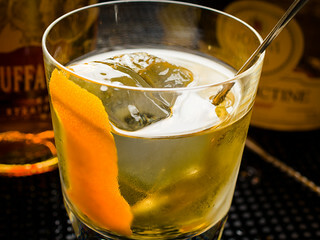 By the time Harry Craddock wrote up the drink in the Savoy Cocktail Book in 1933, the Brainstorm (or “Brain-Storm,” as Craddock fashioned it), had already migrated from a rocks glass into a cocktail stem, a change Patrick Duffy endorsed a year later in The Official Mixer’s Manual . In 1947, Trader Vic was still making the Brainstorm with Irish whiskey, but somewhere around mid-century, American whiskies started to get into the mix. My 1958 edition of Charles Embury’s Fine Art of Mixing Drinks recommends rye whiskey. About the only constant over the past hundred years has been the overall constitution of the drink—some kind of whiskey, some kind of vermouth, Bénédictine, and an orange twist. The early versions of the Brainstorm were dominated by the whiskey; vermouth and Bénédictine were added only in dashes. Early recipes specify only “French vermouth,” which I normally interpret to mean “dry vermouth” (as opposed to the sweeter French or Chambury Bianco style). The Brainstorm Cocktail—the modern stem glass version, and the original rocks glass version, with small bar spoon for stirring. The original Brainstorm is very whiskey-heavy—the dashes of vermouth and Bénédictine do very little to modify what could just be considered a slug of whiskey. Modern recipes tend to mix the drink a bit sweeter, with proportions suggested by the Old-Fashioned structure, more like 4:1:1. Modern versions of the Brainstorm are also more likely to use Bianco, or even sweet vermouths, and may substitute Scotch, rye, or bourbon as the whiskey component. As I’ve said before, I like my whiskey drinks to taste like whiskey drinks, but the Brainstorm’s progression toward something that looks more like a Manhattan or Old-Fashioned is a good evolution, in my opinion, and provides a more interesting, balanced cocktail. Build in Old-Fashioned glass containing one large piece of ice. Express orange peel over the drink, then add peel to the glass. Traditionally, serve with a small bar spoon in the glass. Stir with ice until cold, and strain into a chilled cocktail stem. Express orange peel over the drink, then add peel to the glass. Your choice of whiskey seems to be a matter of personal preference. The drink is excellent with either Irish or bourbon, the difference being whether you like barley whiskies or corn. The bourbon version seems a bit sweeter, and seems to have a bit more body, than the Irish version—typical impressions from bourbon-based cocktails. The 4:1:1 proportion seems to be a very good starting mix for either type of whiskey. 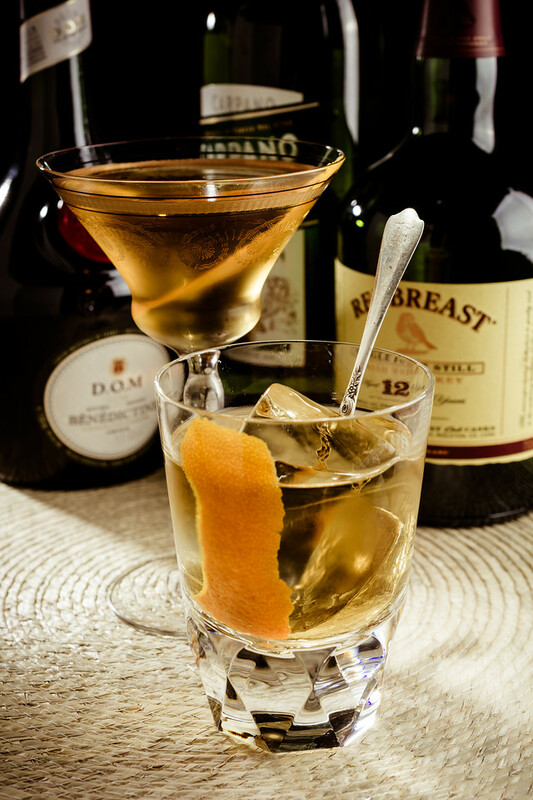 Changing to 5:1:1 gives a distinctly more whiskey-forward cocktail, and reduces the sweetness a bit. The bianco vermouth works better in the Brainstorm than the usual French dry vermouth. It seems to blend better with the whiskey (either Irish or American), and it helps give the drink some body, a richer mouthfeel than the dry vermouth version. The overall impression of the Brainstorm is one of balanced sweetness, with just enough of the whiskey coming through to retain its character. Some would say that the sweetness makes the Brainstorm better suited as an after-dinner or late night cocktail, than as an aperitif. One of the intriguing items buried in Ensslin’s original recipe is the instruction to “serve with a small bar spoon in glass.” I haven’t seen a history of this presentation, but the spoon does show up occasionally, particularly in pre-Prohibition bar manuals. It seems to have been the practice in some bars to serve “built” drinks—cocktails made directly in the serving glasses—with the small spoon (sometimes called a “toddy spoon”) in the glass; I imagine the idea was that the customer could then mix the drink himself; it would be particularly useful for sugar-sweetened drinks like the Old-Fashioned, allowing the customer to continue stirring any undissolved sugar. “Whiskey and Bar Spoons: the Brainstorm Cocktail” at cold-glass.com : All text and photos © 2017 Douglas M. Ford. All rights reserved. Entertaining write up and lovely photos. As usual. Thanks. The rocks glass is very nice. Would you share what they are or even where to purchase? Another great post. Benedictine takes me back to an ex-boyfriend who loved it. The Brainstorm looks quite tasty, and a perfect early Friday evening cocktail to take off the edge from the workweek. Yes, it does sand down the rough edges nicely. Thanks! Yes, it seems you could make an endless list of variants. Hope you enjoy it. Excellent write-up, can’t wait to make this recipe. And as always, beautiful photos. Very good drink. Your description is dead on. And your photos?–Gorgeous as usual. Thanks, Robert, I’m glad you enjoyed it. I love the stem glass in the above picture of the Brainstorm Cocktail! Can you share what the design is called? It is just lovely. I wish I could help you, Julia, but it’s a glass I found in an antique store, and I have no idea what it’s called, alas! I agree, it’s a charmer. I’m glad you enjoy them, thanks. Whiskey and Barspoons: the Brainstorm Cocktail – Cold Glass | Ποδήλατο καφέ - podilato caffè- (bicicletta caffè, bicycle cafe, bisiklet kahve, bicicleta café, café vélo, قهوه دوچرخه , 自行車咖啡, бицикл кафа )..